Been a long month in the writing department (so many short stories to churn out for so many places), but my latest acceptance is actually a last-minute reprint, and it comes to one of the longest running zines of science fiction and fantasy literature. PABLO LENNIS. Issue No. #246. Like last month’s issue, its contents are rather abstract in form. 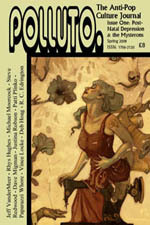 It’s also the first issue in quite some time to feature a thin, semi-gloss cover. This issue features works by: Lawrence Dagstine, Paul Truttman, Steve Sneyd, Albert Manachino, Gerald Heyder, John Binns, Herbert Jerry Baker, Peter Layton, Rose Gordy, Gary Every, and Joanne Tolson. My most recent acceptance comes to a quarterly journal which features some big names: we’re talking Jeff Vandermeer, Michael Moorcock, Steve Redwood, Rhys Hughes, Vince Locke (former illustrator for The Sandman), Patti Plinko, Justina Robson, R.C. Edrington, Dave Migman, Deb Hoag, Paparazzi Whore, Mike Philbin, Chet Gottfried, John Lee Michael, and MORE. Edited by Adam Lowe and Helen Lyttle. 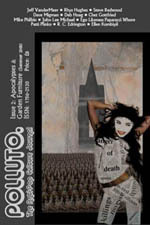 Polluto is a quarterly themed Literary Journal which pushes the boundaries of normal everyday fiction. They’re dedicated to publishing edgy, dark, hip (or anti-hip), queer, extreme or surreal fiction within several genres. Poetry and columns, too. 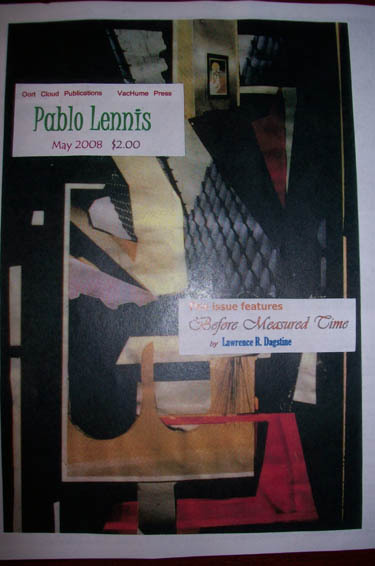 I’ll be in their 4th Issue, late 2008-early 2009. THEME: “Queer and Loathing in Wonderland”. They are also available in limited edition signed hardbacks, and they’re available throughout the UK.